Willow Springs Learning Center four-year-old kindergartners and their families contributed generously to the Sussex Food Pantry this holiday season. They participated in a service project, “Making Wishes Come True,” that resulted in more than 300 gifts that will be distributed through the Sussex Food Pantry to local families. In addition, the Willow Springs staff raised $200 to assist families in need. Lannon Elementary School students, families and staff members collected a brimming barrel of children’s new under garments and gently-used winter clothing that was donated to Sussex Outreach Services. The Lannon staff adopted a family for Christmas and generously donated gifts and gift cards to help them this holiday season. In addition, money was collected through a staff “Jeans for Charity” day and donated to the Sussex Food Pantry. Maple Avenue buddy classes in first and third grades earned money by doing extra work at home. Over $400 was raised and used to purchase items for children served by the Sussex Outreach Services. They contributed items including 53 board or card games, toys, crayons, and DVDs, 16 miscellaneous toiletries and 24 miscellaneous clothing items. Jenifer Maier-Ortlieb’s third grade classroom sent holiday greetings to service men and women in the Marines. Fifth grade through its Uniting Kids and Community program coordinated a stuffed animal drive for children at St. Mary’s Hospital in Milwaukee. The hospital gives stuffed animals to patients before surgery. A total of 182 new stuffed animals were collected. Maple Avenue Home and School collected used summer clothing to assist residents in two of the regions hardest hit by the typhoon in the Philippines. Families and associated groups collected 25 large boxes of clothing. The entire Marcy student body made cards to send to veterans at the Milwaukee VA Medical Center. Students collected socks, hats, mittens and scarves for distribution to the veterans. Kindergarten classes made placemats and hand delivered them to Community Projects for Seniors in Milwaukee. Students donated money to Kayla’s Krew whose mission is to build an all-accessible and fully-inclusive playground in Franklin, Wis.
First grade students collected 300 non-perishable food items for the Sussex Food Pantry in December. Second grade students also collected for the Sussex Food Pantry and made holiday cards to accompany the donations. Marcy staff raised more than $1,300 for the Sussex Food Pantry. This money was raised through Jeans for Charity. Woodside Elementary School families held a successful food drive for the Sussex Food Pantry collecting non-perishable food items during first grade and third grade music programs. 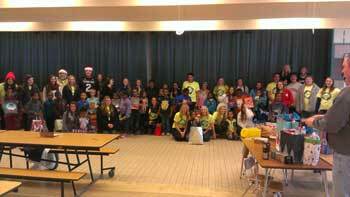 Six families were sponsored by Woodside students and staff through the Christmas Clearing Council of Waukesha County: first grade, two families; second grade, one family; third grade, one family; Woodside Students of Service, one family; and staff specialists and paraprofessionals, one family. Fifth grade students donated almost 1,000 books to the Neighborhood House in Milwaukee. Books will be read by students in an after-school program and used by teachers as instructional resources in early childhood classrooms. Kelly Flanagan’s fourth grade class prepared lunches for the Repairers of the Breach Homeless Shelter in Milwaukee. Woodside Students of Service sorted used crayons and put them into packs that were sent to Africa. Templeton student council conducted a two week Pajama Drive to benefit Scholastic Reading Club Great Bedtime Story Pajama Drive. A total of 134 pairs of new pajamas were collected and distributed to families in need. Eighth grade art students sponsored a school-wide collection of gently-used shoes that were sent to adults and children in Africa. Templeton staff collected toys and gift cards for three adopted families. A Novel Idea book group’s “Snowflakes of Hope” program collected items for families in need. Students accepted donations for Sussex Outreach Services and Project Concern in Cudahy. They donated sweaters, scarves, hats, gloves, mittens, toiletries and gently-used clothing. Club Action raised money at the annual “Rock Fest.” This year a food drive to benefit Sussex Food Pantry was added to the event. A donation of $150 was made to Organic Consumers Association, a consumers advocacy group. Gently-used school supplies and books were collected and personally delivered to St. Catherine’s choice school in Milwaukee. The club has volunteered at Retzer Nature Center and Sussex Recreation Department event “Spooky Sussex.” Toys were made for local animal shelters. Students in Hamilton High School’s Freshman Seminar class spent their lunch period preparing and wrapping gifts for their adopted family. The class was given a family through the Christmas Clearing Council of Waukesha County and students signed up to provide items on the family’s wish list. A total of 15 gifts and a stocking packed with smaller items was provided to the mother, father and five-year-old of the family. One student also brought homemade cookies from home for the family. German Club St. Martin’s Day Clothing Drive: To help people who are less fortunate and in the spirit of the German St. Martin’s Day tradition, the Hamilton German Club collected 450 articles of clothing, jackets and shoes. Items were donated to Red Door Clothes to be distributed to Waukesha families in need. The legend of St. Martin tells of a soldier riding horseback into a small village on a cold evening when he happened upon a beggar on the side of the road who was freezing. Martin (the soldier) had no extra provisions, but wanted to help the man who was less fortunate than he. He cut his cloak in half with his sword and gave half to the freezing man. Word of Martin’s good deed spread throughout the land and eventually Martin was canonized. Spanish Club adopted three Hispanic families (with eight children total) through the Christmas Clearing Council of Waukesha County. Students in all Spanish classes donated a total of $1,500 to purchase gifts for the families including winter jackets, clothing, toys, books and gift cards. Spanish Club members wrapped the gifts and the officers delivered them to the families. National Honor Society held a November blood drive. At this event, over 100 pints of blood were donated — enough to save more than 300 lives. Members also hosted several food drives to benefit Sussex Outreach Services the week before Thanksgiving, producing more than 3,000 food items and $1,500 in donations. A toy drive to benefit Children’s Hospital of Milwaukee Cancer Care Gifts for Kids was held in December. Over 200 toys were donated. Hamilton School Student Council adopted one family through the Christmas Clearing Council of Waukesha County. The family is a single-parent household with four children. 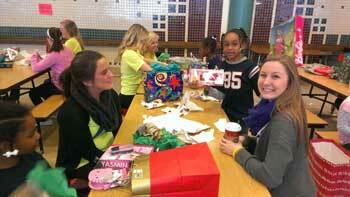 Student Council members joined together to shop and wrap the gifts. Gifts were delivered to the parent by the advisor and students. Student Council also sponsored the annual No Shave Novembeard campaign during November. Hamilton males pledged to go unshaven during November. Each participant obtained sponsors, usually other students, who pledged an amount for each day the young man does not shave or a flat donation at the end of the month. Proceeds were donated to Pancreatic Cancer Research. Hamilton DECA members shopped for holiday presents for the first grade class at Gaenslen Elementary School in Milwaukee. First graders at Gaenslen completed “All About Me” forms and Hamilton DECA members provided gift bags with at least one nice toy and other inexpensive gifts to these students. Gaenslen Elementary is located in a Milwaukee neighborhood that has one of the lowest household incomes in the state. Several of the first grade students are currently homeless. Students at Hamilton enjoy one of the highest household incomes in the state. In addition to delivering presents, Hamilton DECA took cookies and juice, and the Hamilton students spent an afternoon Dec. 11 with the children they shopped for, reading them books, putting together their new toys, and playing with them. This has become an annual event for Hamilton DECA and is always a heart-warming experience for the students who participate. Two advisors and 34 students made the trip.